Let’s Get Started. 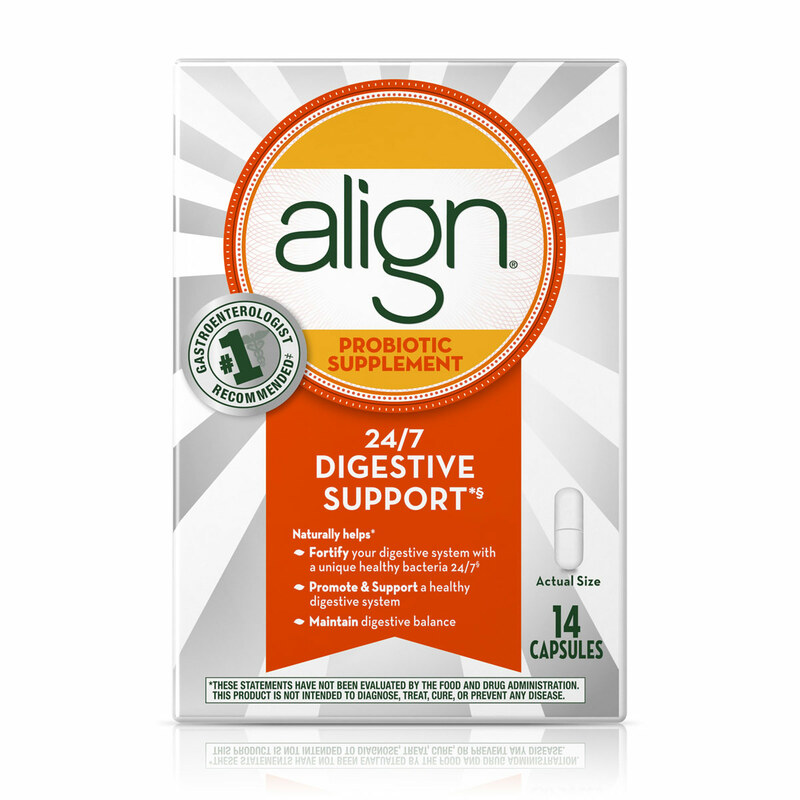 We’re glad you decided to use Align to help promote and support your digestive health. * As with other probiotics, some have reported experiencing some gas and bloating in the first few days of taking Align. This may be temporary while your system is adjusting. One capsule, same time each day. To make Align part of your daily routine, take one capsule at the same time, daily. Choose a time that fits your lifestyle. Wake up and brush my teeth. Don’t forget to store Align at room temperature, keeping capsules in original blister packaging until use. Drink plenty of water. Water keeps your body hydrated and helps keep you regular. Read food labels. Some foods high in fat can be harmful to your digestive health––and your overall health. Be sure to read food labels so that you understand how much fat your food has per serving, and how many servings there are per package. Cut down on caffeine. Too much can send your stress levels soaring—and throw your digestive tract off balance. If you can't eliminate it completely, try to alternate caffeinated beverages with mineral water or decaffeinated tea. Soak away stress. A warm bath will help your muscles relax and ease cramping. The Cobra Pose is a yoga position that can help you feel relaxed and reduce anxiety. It also can help stabilize digestion and minimize cramps. Please seek your physician's advice before beginning a new exercise routine. Lie face-down on the floor with your legs together and your hands palms-down under your shoulders. Rest your forehead on the floor. Inhaling, push off with your hands, and lift your head and chest off the ground, tilting your head back. Hold for two or three deep breaths, and then exhale and slowly come down. Repeat two to five times. Challenge yourself and commit to good health during your first eight weeks of taking Align.